I think that one of the most profound experiences I had with Srila Prabhupada took place in 1969 when I was serving him during his visit to Hamburg, West Germany. I was somehow chosen to take Srila Prabhupada on his morning walk, cook his lunch and give him a massage each day. There weren't very many devotees in Hamburg at the time, so I somehow got the mercy. This incident took place on Ekadasi. I had given Srila Prabhupada his breakfast and taken away his plates. He then proceeded to cover his head with his chadder, sit in his chair by the window and chanted. So naturally, I figured something was up, but didn't know what. Sometimes on Ekadasi you don't quite know what to expect because it is a special day. As the morning progressed, I cooked his Ekadasi lunch and then got ready to give Srila Prabhupada his massage. 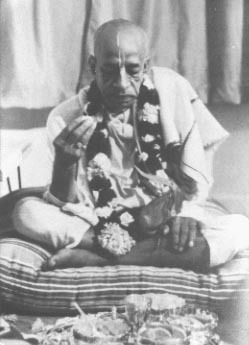 Reflecting back, I probably didn't give Srila Prabhupada a very good massage, but at the time, I didn't really know what he needed. Anyway, he kindly accepted my service. I got out his oil and put down the mat he usually sat on, and then he came in and said to me: "You should pray to Krsna for me." Well, needless to say, I was quite taken aback. Here is my spiritual master, a great exalted Krsna conscious personality, asking me to pray to Krsna for him. Well, I went through quite a few changes in a few seconds, and finally blurted out: "Well, I don't think that would work." "Why not? You are a devotee of Krsna," he replied. Well, I just left it at that and gave Srila Prabhupada his massage. It was wonderful and surprising that such a great personality as Srila Prabhupada could be so humble. This is one of the qualities of Srila Prabhupada that is very attractive to me, and also very endearing.